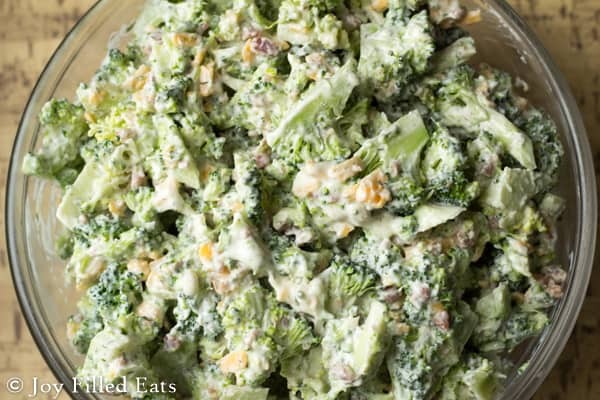 This Easy Broccoli Salad with Bacon will become your go-to summer side dish. It is creamy and refreshing with the bold flavors of cheddar and bacon. 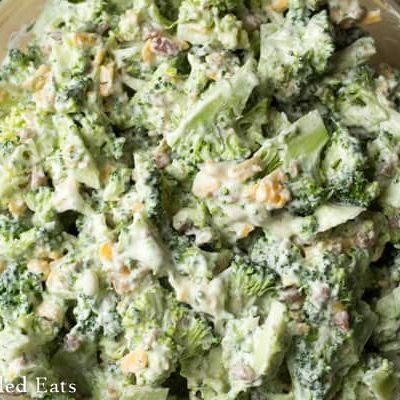 This Easy Broccoli Salad with Bacon has been a summer favorite of ours for the last couple years. I buy the big bags of cleaned, washed broccoli from Costco so all I have to do is cut them a little smaller and mix the ingredients. If we are going to a big barbecue I’ll double or triple this to make the entire 2.5 lb bag. This easy raw broccoli salad is always one of the first salads to disappear. I love it as a side dish when we have grilled chicken or smoked ribs. Sometimes to change it up a bit instead of the seasonings listed I just use Goya Adobo seasoning to taste. If you try that it cuts the ingredient count down to only 6. 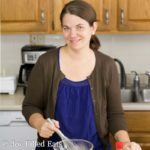 I try to keep the ingredients under 10 in most of my recipes. The Goya seasoning is salty so start with a little and add slowly. I’ve over salted dishes a few times with that one blend. Mix mayo, sour cream, and the seasonings. If serving right away fold in the bacon and cheddar. Fold in broccoli. If you are preparing this ahead mix the cheddar and bacon in right before serving. This is important so the bacon doesn't get mushy and the cheddar doesn't melt into the dressing. Holy moly, girlfriend! You’ve done it again! I have another new favorite! So quick, easy and delicious! The ingredients for this salad will be on hand as often as possible! Thank you! Wow! This was so yummy! Thanks so much for a quick and tasty dish! A new favorite! Do u boil broccoli? Or use it as is? I use it raw in this dish. 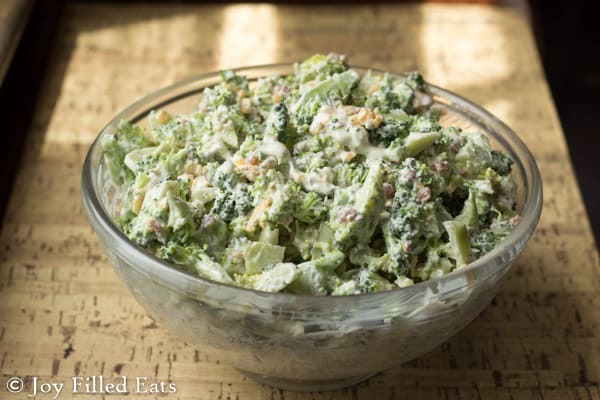 Broccoli salad is one of my favorite things, but there's usually a ton of sugar in it. I love that this recipe is sugar free and STILL tastes absolutely fantastic! I don't have to feel guilty enjoying it! 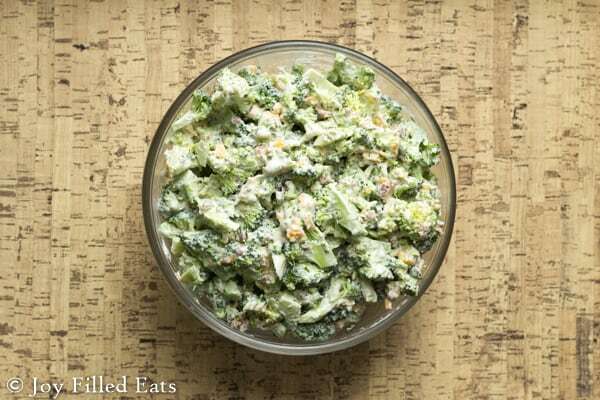 This looks like the perfect broccoli salad recipe! I can't wait to make it for my next cookout! Is it fresh or dried dill? I use dried but fresh works too. I normally use the Just Mayo brand. Any suggestions as to how I could cut down further on the carbs. There's a little too many compared to what I'm allowed daily. Thank you for any input or suggestions. Your recipe looks delicious by the way!!! Most of the carbs come from the broccoli in this recipe. Cauliflower has a tiny bit less than broccoli so you could use half broccoli and half cauliflower. Mayo has less than sour cream so you could use more mayo and less sour cream as well. The combinations of seasonings gives it the ranch flavor. It is basically a thick homemade ranch dressing. This is one of our favorites and so will make this version very soon. I love the ease of prewashed broccoli! We like sunflower seeds in ours but other than that, it will be made with this recipe. Thanks! Do you use frozen broccoli or fresh, or could you use either you choose?